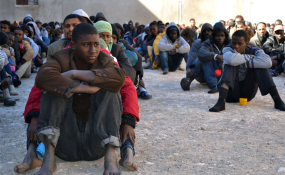 UN human rights report urges end to 'unimaginable abuse' of migrants in Libya. Milan — Libyan security forces forcibly removed 79 migrants and asylum seekers on November 20, 2018 from the Panama-flagged cargo ship Nivin in the port of Misrata in Libya, after they refused to leave the ship for 10 days, Human Rights Watch said today. Security forces reportedly used force and tear gas. An unknown number of people were taken to hospital, and others were taken to the al-Karareem detention center in Misrata. "This is the worst possible conclusion to the desperate plea of the people on board the Nivin to avoid inhuman detention in Libya," said Judith Sunderland, acting deputy Europe and Central Asia director at Human Rights Watch. "The situation is the result of efforts by Italy and the European Union to obstruct rescue operations by nongovernmental organizations and empower the Libyan Coast Guard even when Europe knows that Libya is not a safe place." Libyan authorities should immediately allow United Nations and nongovernmental personnel to visit the people removed from the cargo ship, find alternatives to their detention, and investigate the possible use of unlawful force. The Nivin, acting on instructions from the Italian Maritime Rescue Coordination Center, had rescued 95 people from a sinking rubber boat in international waters off the Libyan coast on November 7 and subsequently docked at the port of Misrata on November 10. According to the UN, the group includes Ethiopian, Eritrean, Somali, South Sudanese, Pakistani, and Bangladeshi nationals. Human Rights Watch conducted research in detention centers in areas controlled by the UN-backed Government of National Accord in Libya in the summer of 2018, including the al-Karareem center. There and elsewhere, asylum seekers and migrants alleged abuse by guards, members of armed groups, and smugglers that included beatings, inhumane detention conditions, forced labor, extortion, and sexual assault.